I’ve been meaning to post this recipe for a while, but I like to accompany my recipes with a picture, and my family keeps cutting into the loaves before I get a chance to take a photograph! This recipe is for a fluffy, high-rising loaf that stands up well on its own, but really shines when it is speckled generously with fresh or dried herbs. As a bonus, this bread is also dairy-free, nut-free, vegetarian, and can be made vegan with the proper sourcing of ingredients. 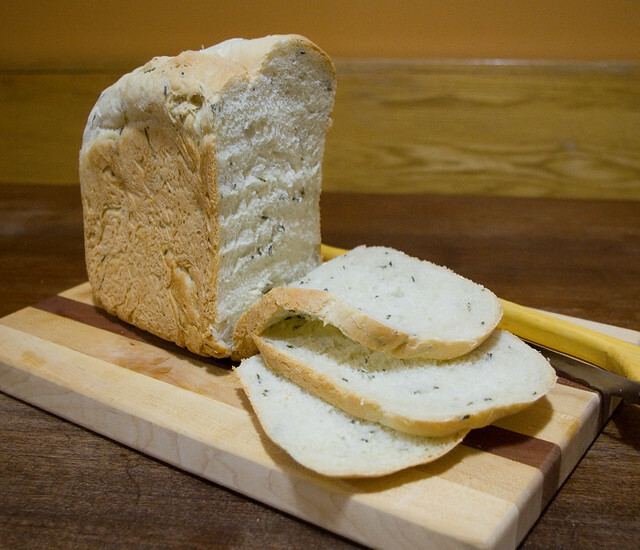 Because of the herbs, it is a very savoury bread, and pairs well with eggs and meats — especially as toast with dipping eggs, and as sandwich bread for leftover roast or cold cuts. A 2lb loaf made with rosemary. Quantities for a 1.5lb loaf are in bold, quantities for a 2lb loaf are in bold purple. However, this loaf is very light and fluffy — so it expands a lot. Use the settings for a 1.5lb loaf if your machine goes up to 2lbs; only make a 2lb loaf if your machine has the capacity to make a loaf that is 3lbs or greater. Every bread machine comes with an instruction booklet (most of which are also generally available online) that will specify the order that ingredients should be added. Mine says that liquids should be added first, then flour, then yeast. When preparing this recipe, the instructions for your specific bread machine should take first priority, so if your manual says to add the ingredients in a different order, do so. Ensure that the flour covers the liquids entirely. Set the bread machine to the basic/normal/white setting, with a light or medium crust to your preference. Press start. Running this cycle should take about four hours. Remove the bread at the end of the baking cycle. Turn it out of the pan onto a wire rack to cool, making sure that the kneading paddle(s) are removed from the bread. Serve immediately (being careful to cut gently when it is warm), or when cool. Do not wrap the loaf or put it into a container until it is entirely cool, or it will become mushy. * For a healthier loaf, substitute half of the all-purpose flour for whole-wheat flour. A whole wheat loaf will not rise as high, however. **Suggestions: rosemary, dill, oregano, basil, chives, thyme, or sage. Posted on January 29, 2018 January 17, 2019 by owntwohandsblogPosted in Cooking, RecipesTagged bread, bread machine, breadmaker, Cooking, dairy-free, food, homemade, nut-free, recipe, Recipes, vegan, vegetarian, yeast. Sounds wonderful… I think I’ll try this tonight! I’d be grateful if you’d let me know how it turned out!